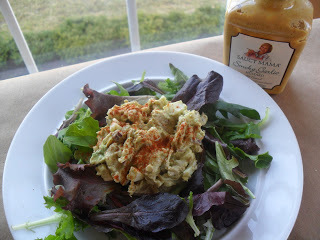 Chicken Salad with Saucy Mama Smoky Garlic Mustard & A Tasty Giveaway Too! 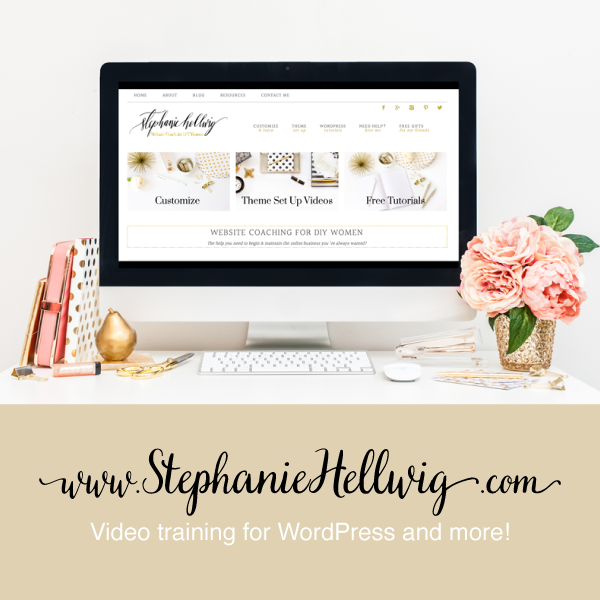 Recently, I was challenged to create a recipe for the “Skinny Mama-Cooking With Mustard Recipe Contest”, sponsored by Saucy Mama. After creating several recipes, I’m entering my favorite: Smoky Garlic Chicken Salad. 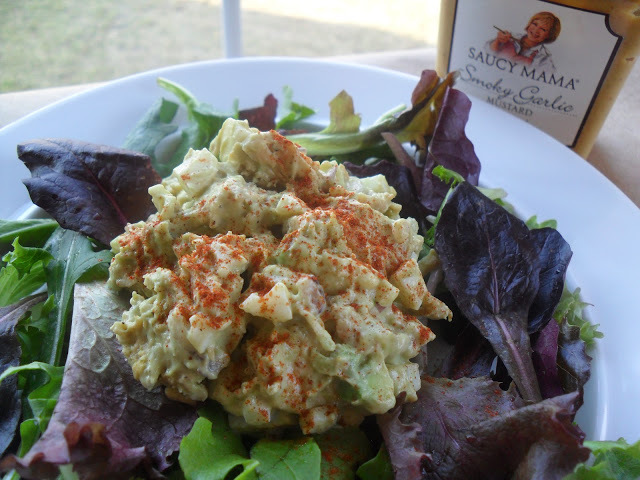 In this salad, I used avocado and Saucy Mama’s Smoky Garlic Mustard blended together to create a delicious binder, instead of mayonnaise. This recipe fits within the popular South Beach and Atkins diet plans. I mentioned a giveaway…Courtesy of Saucy Mama, the giveaway is a gift set of their delicious mustard, featuring: Saucy Mama Tarragon Lemon Mustard, Saucy Mama Dijon, and Saucy Mama Smoky Garlic Mustard. To enter for this giveaway, just leave a comment on this post by Friday, March 2, 2012, 9:00 p.m. EST. 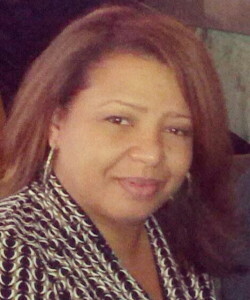 The winner will be chosen at random and notified on Monday, March 5, 2012. 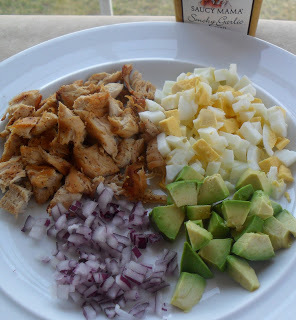 Chopped chicken, egg, avocado, red onion, and a bottle of Saucy Mama Smoky Garlic Mustard. 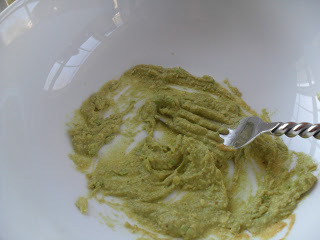 It’s like binding the chicken salad together with guacamole! mustard is my favorite condiment… after frank’s hot sauce. So easy and looks delicious , I love chicken salad and without mayo – wow it is amazing! I would love to try some Saucy Mama Mustard! Please don’t include me in the giveaway since I already have their mustards, but I just had to comment and say that this sounds delish! 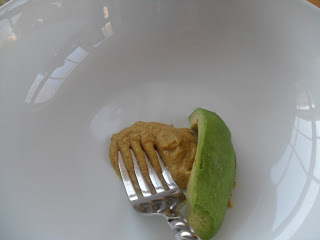 Love that you blended the avocado and the mustard together. The smoky garlic is my favorite!! I am a mustard kind of girl and I love chicken salad! This recipe sounds wonderful! Maybe I will get lucky. I think I have told you a few times already, but I love your blog. Love the avocado in the chicken salad. That sounds delicious! I’m going to have to try this recipe this weekend! 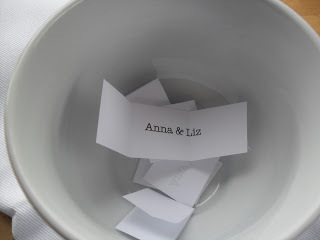 Contest Officially Closed…Winner will be drawn and notified on Monday, March 5, 2012. Oh my goodness! We are so excited ! We can’t wait to try some Saucy Mama Mustard! Thank you for this opportunity Shawn!! Oh wow – this looks amazing! YUM!